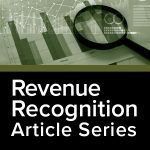 New Revenue Recognition Framework: Will Your Entity be Affected? One of the most significant changes to financial accounting and reporting in recent history is soon to be effective. Reporting entities across industries must evaluate their compliance with the new revenue recognition standards, identify challenges, and develop an implementation plan accordingly. This article is intended to assist management in preparing for implementation of the new reporting framework. Almost a decade ago, the Financial Account Standards Board (FASB) and the International Accounting Standards Board (IASB) undertook a joint project to develop a common standard for revenue recognition between generally accepted accounting principles in the United States (U.S. GAAP) and International Financial Reporting Standards (IFRS). In August 2015, as a result of their work, the FASB amended the FASB Accounting Standards Codification (ASC) through Accounting Standards Update No. 2014-09 (ASU 2014-09) which created a new Topic 606, Revenue from Contracts with Customers (ASC 606). Previous U.S. GAAP guidance contained numerous revenue recognition requirements for particular industries or transactions which resulted in different acceptable accounting results for economically similar transactions. The new standard is designed to improve consistency of requirements; comparability of revenue recognition practices across entities, industries, and jurisdictions; and usefulness of disclosures. Any entity that either 1) enters into contracts with customers to transfer goods or services or 2) enters into certain contracts for the transfer of nonfinancial assets unless those contracts are within the scope of other standards. The new standard applies unless activities are specifically included within the scope of other standards. Leasing contracts, insurance contracts, financial instruments contracts, certain nonmonetary exchanges, and guarantees are not within the scope of the framework. Currently, revenue is recognized with consideration of two factors: 1) being realized or realizable and 2) being earned. Revenue is realized when goods or services, merchandise, or other assets are exchanged for cash or claims to cash and can be recognized, if collectability is reasonably assured. Revenues are considered to have been earned when the entity has substantially accomplished what it must do to be entitled to the benefits represented by revenues. The framework is effective for public entities presenting U.S. GAAP financial statements for periods beginning after December 15, 2017, including interim periods within that reporting period. A public entity is any of the following: a public business entity; a not-for-profit entity that has issued, or is a conduit bond obligor for, securities that are traded, listed or quoted on an exchange or an over-the-counter market; or an employee benefit plan that files or furnishes financial statements to the SEC. For all other entities (hereafter “non-public entities”) presenting U.S. GAAP financial statements, the framework is effective for periods beginning after December 15, 2018, and interim periods within annual periods beginning after December 15, 2019. Early application is permitted for non-public entities one year prior to the aforementioned effective periods. For entities presenting IFRS financial statements, the framework is effective for annual periods beginning on or after January 1, 2018. Entities will be required to either adopt the provision using a full retrospective approach to the earliest reporting periods presented (potentially all financial statements would be restated as if the new standard were in effect) or modified retrospective approach with the cumulative effect of the initial application recognized at the beginning of the period of initial application (prior year financial statements would not be restated). Under this second option, additional disclosures are required, including the amount by which each financial statement line item is affected in the current reporting period by the application of the new standard as compared to the superseded guidance. Careful consideration should be given in determining which implementation approach to take as one method may be more preferred depending on your circumstances. For example, entities with inherently more timing differences in the recognition of revenue resulting in significant deferred revenue balances, such as those in the service industry, may wish to elect the full retrospective approach. Electing the modified retrospective approach could result in revenues “disappearing” into a cumulative effect adjustment to opening equity. The major challenges include fulfilling disclosure requirements, determining the validity of contracts for accounting purposes, identifying performance obligations, accounting for variable consideration, timing of revenue recognition, costs to obtain/fulfill a contract, gross versus net revenue presentation and accounting for licenses, if any. To successfully implement the new standard, many companies may need to implement new internal controls over contracts with customers and make changes to processes or systems. Entities affected should develop an understanding of the magnitude of the changes to their entity; establish a plan for the adoption of the standard; determine staffing, training and IT/systems implications; and establish a process and controls to capture appropriate data to ensure compliance with the standard. The adoption of the new revenue standard may seem like a daunting task but with careful consideration and the right implementation plan, entities will be able to complete the process and ensure compliance with reporting requirements under U.S. GAAP.